Like many little boys, as a child, Bill Voiselle dreamed of being a star. A native of Ninety Six, SC, Voiselle proudly spent his high school days playing baseball on the school’s baseball team. This, in turn, would lead to his dream becoming a reality. In 1942, Bill Voiselle, the young man from the small town of Ninety Six, became a part of the New York Giants baseball team! During his sports career, he played with 3 different professional ball clubs: the Boston Braves, the Chicago Cubs and the New York Giants. 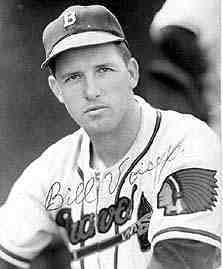 In the 1948 World Series, Voiselle was the third starting pitcher for the Boston Braves. His nickname that followed him throughout his life was: ‘Ole 96’. You see, he was… and is still… the only player to ever wear his hometown’s name on his jersey: 96; and he wore it proudly! Bill retired in 1957. After his professional days of baseball were over, he came back to Ninety Six to play semi-pro ball with the mill team. Voiselle passed away on January 31, 2005 at the age of 86 at Self Memorial Hospital in Greenwood, South Carolina. Ninety Six is proud to call Bill Voiselle….’Ole 96’…. our native son!